Joy Harjo has won a Native American Music Award for Best Female Artist of the Year for her album Winding Through the Milky Way. 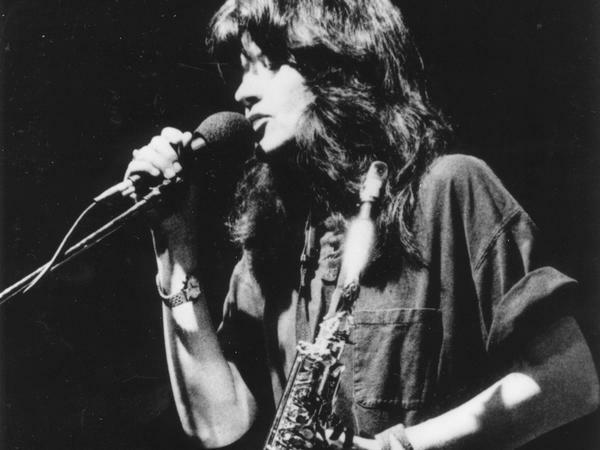 In her new memoir, Joy Harjo recounts how her early years — a difficult childhood with an alcoholic father and abusive stepfather, and the hardships of teen motherhood — caused her to suppress her artistic gifts and nearly brought her to her breaking point. "It was the spirit of poetry," she writes in Crazy Brave, "who reached out and found me as I stood there at the doorway between panic and love." NPR's Neal Conan talks with Harjo, now an acclaimed poet, performer and writer of the Muscogee (Creek) Nation, about the dreams, visions and heartache that led her to find her voice as a poet and musician. "Sometimes, I think, in order to get to something that we really want or we really love or something that needs to be realized, that we're tested. I mean, I think if you look at any stories all over the world, they are usually set up as, OK, here's where I start, here is where I want to go, and here are the tests. "And they were pretty intense tests ... I failed a lot of them, or you find a way around. And maybe there is no such thing as failure ... that's kind of what I've had to come to. Yes, I mean, there's times ... when we fail. But it's a useful thing. "At least I've had to come to that in my life, to realize that this stuff called failure, this stuff, this debris of historical trauma, family trauma, you know, stuff that can kill your spirit, is actually raw material to make things with and to build a bridge. You can use those materials to build a bridge over that which would destroy you." "I think music is what attracted me to this world. I could hear my mother singing, and I thought OK, that's a pathway I can follow. And it was that moment — there was kind of a trans-cosmic consciousness, transcendental moment came when I was standing in — this is before seat belts — in my parents' car. And I think it was Miles Davis, his horn came on. "Of course I didn't know Miles Davis or horn, and ... that music opened an incredible door, and I was out there, and I could almost see the shape of my whole life. And I have a great love of jazz, and actually it's close to my Muscogee tribal people. "I'm working on a story now that proves that — that includes us in the story of American music. Most people don't know that Congo Square was originally a Muscogee ceremonial ground ... in New Orleans, the birthplace of jazz." "I [had] felt like I had lost my voice, too. And sometimes, to find it ... what I've learned is it needs to be lost for a while. And when it wants to be found, you'll find it. "But I would say is that you just put yourself in the place of poetry. You just go where poetry is, whether it's in your heart or your mind or in books or in places where there's live poetry or recordings. "And, you know, it's like looking for love. You can't look for love, or it will run away from you. But, you know, don't look for it. Don't look for it. Just go where it is and appreciate it, and, you know, it will find you." This is TALK OF THE NATION. I'm Neal Conan in Washington. In her new book, Joy Harjo writes: Women often turn their anger inward, and at Indian school, some of us mutilated ourselves. I marked myself once, with a knife, she continues. I was disappearing into the adolescent sea of rage and destruction. The mark of pain assured me of my own reality. The cut could speak. It had a voice that cried out when I could not make a sound in my own defense. I never made such a mark again, she writes. Instead I chose to slash art onto canvas, pencil marks onto paper, and when I could no longer carry the burden of history, I found other openings: I found stories. 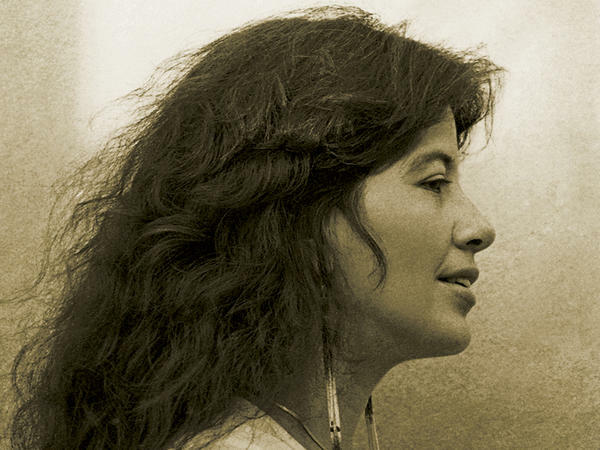 Joy Harjo took a difficult to her life as an artist, poet, performer and writer. Before her days of international acclaim, her journey with art stretched a long and winding path - her parents' troubled relationship, an abusive stepfather, the challenges of teen motherhood - it was the spirit of poetry who reached out and found me as I stood there at the doorway between panic and love. Poets, how did you find your voice? Was there a moment? 800-989-8255. Email us, talk@npr.org. You can also join the conversation on our website. That's at npr.org. Click on TALK OF THE NATION. Later in the program, NPR's Kelly McEvers on her recent trip to the battlegrounds of Yemen. But first Joy Harjo joins us from the studios of Public Radio Tulsa. Her memoir is called "Crazy Brave." Nice to have you with us today. JOY HARJO: Yeah, it's good to be here. CONAN: There's a story you tell in the book about a time in first grade when you decide to color a ghost green. HARJO: Yes, and I realized the power of the collective then, or the collective imagination, when it's going in one direction. It caused quite an uproar. CONAN: Because ghosts, of course, are supposed to be white. HARJO: Right, and I had seen a green ghost that could give people pneumonia, and of course I wasn't going to say that in first grade. CONAN: That moment we were just talking about, the moment where you were torn between love and panic, that is another moment you might want to - it might not have been easy to talk about. It was a dream about wrestling with a monster. HARJO: Yes, yeah, that's toward the end of the book, and it's like I had been stalked. I think all of us become - we are stalked by our fears until we turn around and face them, just as we are probably stalked by love and sometimes we're even just as afraid to turn around and look at love. But in that particular dream, which had been haunting me for years, I finally was forced to turn around and look. And once I did, it dissipated. CONAN: I wonder, there's a poem that you write shortly after that. You say it's one of the first poems you wrote. And I was wondering if you could read it. Do you have a copy of the book with you? CONAN: That's on page - if I can find it - 162, and I have to say this is - just as your life up to that point is dealing with a lot of difficult and haunting subjects, so does this poem. But you tell us; go ahead. HARJO: Yes, the book goes up to the time I start writing poetry, which was - I needed to. I needed to find my voice, I think, in order to live. And this came at that time when I turned around, and I was forced to turn around and look at the monster and see the monster. And this poem came out, almost - I usually revise. The memoir I probably revised 100 times, and it took many, many different shapes. And most poems I revise, and this one I revised, but it came out almost, almost as it is. And I'll read it. (Reading) I release you, my beautiful and terrible fear. I release you. You were my beloved and hated twin, but now, I don't know you as myself. I release you with all the pain I would know at the death of my children. You are not my blood anymore. (Reading) I give you back to the soldiers who burned down my home, beheaded my children, raped and sodomized my brothers and sisters. I give you back to those who stole the food from our plates when we were starving. I release you, fear, because you hold these scenes in front of me, and I was born with eyes that can never close. (Reading) I release you. I release you. I release you. I release you. I am not afraid to be angry. I am not afraid to rejoice. I am not afraid to be black. I am not afraid to be white. I am not afraid to be hungry. I am not afraid to be full. I am not afraid to be hated. I am not afraid to be loved, to be loved, to be loved, fear. (Reading) Oh, you have chocked me, but I gave you the leash. You have gutted me, but I gave you the knife. Yu have devoured me, but I laid myself across the fire. I take myself back, fear. You are not my shadow any longer. I won't hold you in my hands. You can't live in my eyes, my ears, my voice, my belly, or in my heart, my heart, my heart, my heart. (Reading) But come here, fear. I am alive and you are so afraid of dying. CONAN: Joy Harjo from her new book "Crazy Brave," an early poem. What's the name of that? HARJO: The poem is called "I Give You Back," but I often refer to it as "Fear Poem." CONAN: There are so many points in your story where you are facing, confronting a situation, yet afraid to actually act. HARJO: That's true. That even happened with the writing of the memoir. I started on it 14 years ago, and it went through many - I would walk away from it because this was the story, this is the story I didn't want to write. I wanted to write, you know, cool - I wanted to write maybe Indian stories or stories of the '80s and activism and being an artist and, you know, all that cool stuff. CONAN: This is not your and-then-I-met-Mick-Jagger memoir. HARJO: Yeah, I wondered about that. I figured I had a ghost book that was being written somewhere alongside this with all the names and dates and places and things that - the other things. But this is the one that wanted to come out first. CONAN: It's interesting, there's another point in the book where you say you have lines on one hand that define the life of a girl who died, a drug addict on the streets of a big city as a teenager, and on your other hand is the life you've actually led. HARJO: Yes, yeah, yes, and that makes a lot of sense. And maybe we all carry around on one hand, you know, all of our failures, and then it's - the other hand is what we make of those things. CONAN: I think a lot of us think that on the other hand is the career that leads to the Nobel Peace Prize and the prize for physics and probably one for writing novels, too. And the other one is the life we actually led, which is a little more prosaic. HARJO: Well, I think that, too, if you were to look at the lives of Nobel winners or anyone, you're going to find that the list of failures or the path of failures are what lead you to exactly, precisely what you need to know. CONAN: That life, though, of dying of an overdose on the street, it was perilously close. HARJO: Yes, it was. It was too close. HARJO: What saved me was I have - I have a strong sense of dreaming/poetry, music and dance, and I also have a strong line of common sense in the end. And I also feel like I have - and, you know, I have, I think all of us have, you know, an ancestral line or ancestral helpers that all you have to do is ask. And sometimes you don't, you know, they just protect you. And I felt very strongly, at different points in the story, that protection come in fiercely to protect me. CONAN: You call it the knowing. HARJO: Yes, I call it the knowing. I'm sure it has many other names in many other cultures and so on. CONAN: We're talking with Joy Harjo. Her new book, "Crazy Brave," is about finding her voice as a poet. She's of course gone on to a career that includes many other aspects of art and dance and music. We want to hear, though, from the poets in our audience. When was the moment you found your voice? 800-989-8255. Email us, talk@npr.org. Let's begin with - let's begin with Brian(ph), Brian with us from Ocala in Florida. BRIAN: Hello, how are you doing, sir? BRIAN: Good, hello to the poet, as well. I found my voice of writing after the death of my brother. He was killed in a car accident, and I began - I was sitting in a parking lot one day waiting for a business to open, and all of a sudden, it's like out of my pain, I could hear the comfort coming from my brother so much in words, and I began to write a poem called "Weep for Me But Do Not Cry." And I discovered that weeping was a legacy, and crying was pain just passing by. So yes, I still weep and mourn, but it gave me a sense of healing because it doesn't hurt me as bad as it used to. It gave me a sense of understanding. And I found out that even though that may not be a primary definition from the dictionary, it's my definition, and it's what gave me healing, and that's what's help me to get along. So a poet - writing to me, and I've written several others, I've written one called "My Name is Da(ph)" because that's what you call me. I wrote that for my son's 15th birthday. And as I began to write, all of my writing didn't stay on a sad note, it's turning a happy notes. And so I thank you for the show today because it's keeping me to know that sometimes healing comes more - it can come in so many different ways, and writing is a good way. It was a process of my healing, for me to deal with the death of my brother, so thank you, that's my comment. CONAN: Thanks very much for the phone call, good luck with your poetry. BRIAN: ...and have this kind of stuff published. You know, I don't know if you have any information on that. I would like to get it published, but, you know, I'll take my answer off the air, if there's any information she could give me so I could get published. CONAN: All right, Joy Harjo, any advice where this - where Brian might get his poems published? HARJO: I think the Internet, these days, you know, what I always tell people to do is to look and go to the places where poetry is happening, in your city, in your community and online, which is, you know, there are many different communities online. And, you know, find your community, and there you can find the resources for publishing and performing together and so on. CONAN: We're talking with poet and musician Joy Harjo. Her new memoir is called "Crazy Brave." Poets, call and tell us how you found your voice. Was there a moment? 800-989-8255. Email talk@npr.org. Stay with us. I'm Neal Conan. It's the TALK OF THE NATION from NPR News. CONAN: This is TALK OF THE NATION from NPR News. I'm Neal Conan. Among Joy Harjo's many accomplishments, seven books of poetry, a Native American Music Award for Best Female of the Year, now a memoir, "Crazy Brave," about her difficult path to discovery of herself and her art, how she found her voice as a poet and musician. In the book she recalls an early encounter with jazz. She writes: It changed my relationship to the spin of the world. It changed even the way I looked at the sun. You can read more about that experience in an excerpt at our website. Go to npr.org. Poets, we want to hear how you found your voice, 800-989-8255. Email is talk@npr.org. You can also join the conversation on our website. That's at npr.org. And Joy Harjo, there seems to be a recognition as you describe your young self that there was this talent, this expression, this creativity in you all along, and yet there were so many blocks, so many difficulties thrown up. You mentioned the collective imagination in the case of the green ghost, but others were much more personal. HARJO: Yes, and sometimes, I think, in order to get to something that we really want or we really love or that - something that needs to be realized that we're tested. I mean, I think if you look at any, you know, stories all over the world, they are usually set up as OK; here's where I start, here is where I want to go, and here are the tests. And they were pretty intense tests, and you either - I failed a lot of them, or you find a way around. And maybe there is no such thing as failure. Maybe that's - kind of what I've had to come to. Yes, I mean, there's times when we don't, you know, when we fail. But that's - it's a useful thing. At least I've had to come to that in my life, is to realize is that this stuff called failure, this stuff, this debris of historical trauma, family trauma, you know, stuff that can kill your spirit, is actually raw material to make things with and to, you know, build a bridge. You can use those materials to build a bridge over that which would destroy you. CONAN: That which would destroy you. You may not have failed, ultimately, because you, as you say, turned this material into something much greater, but it seems to me that along the way, people failed you. HARJO: That's true. Yeah, they did, and I'm sure along my way, I've probably failed a few people, too. And maybe that's, you know, that's part of the story. I mean, it's a huge story matrix. Sometimes I get moments into seeing it. It's like this huge globe with all of these connections, and if you follow every connection, you'll find out that every one of us, these strands are incredible and almost without number, and shining and dark, but they're always moving, always changing. And in the end, we would see, if we could really see - like standing on the moon and looking is one perspective, and then you can stand even farther out, and when you stand way, way, way out there, you see how it all fits together, and you see how we're all related and how the stories hook up and how everybody, everybody's story is absolutely necessary for the whole - everybody, including the creatures, including, you know, including the elements, including the animals, that all of our stories are important to the story matrix. CONAN: Here's an email from Jessica(ph): Although I wrote narrative poetry in my early years and teens and admired poets like Joy Harjo and Alice Notley, I feel that I began to really be myself as a poet after I came back from a trip to China and discovered John Cage when I was 16. I realized I could play with language, and the poetic line doesn't need to be immediately recognizable as melodic or narrative. I could play with language like paint or jazz. This was freeing and allowed me to voice denser emotions and memories because I could dance from one memory or emotion to another without thinking that the reader needed to follow very clear, narrative lines. You write a lot about the influence of music on your life. HARJO: Yes, I do. I think music is what attracted me to this world. I could hear my mother singing, and I thought OK, that's a pathway I can follow. And it was that moment - there was kind of a trans-cosmic consciousness, transcendental moment came when I was standing in - this is before seatbelts - in my parents' car. And I think it was Miles Davis, his horn came on. Of course I didn't know Miles Davis or horn, and I followed - that music opened an incredible door, and I was out there, and I could see - almost see the shape of my whole life. And I have a great love of jazz, and actually it's close to my Muskogee tribal people. CONAN: In New Orleans, yes. HARJO: Yes, in New Orleans, the birthplace of jazz. CONAN: Let's get another caller in, this is Zach(ph), and if - there we go, Zach, are you with us? ZACH: Yes, can you hear me? CONAN: Yes, you're on the air, go ahead please. ZACH: Yes, I just wanted to say that I dabbled in poetry when I was a young man, before going to West Point for military training. And I continued writing after graduating. But a lot of it was just emulating poets and writers whose language and use of language that I really enjoyed and respected. And it wasn't until I was a company commander, and one of my soldiers took his life, that I found my own voice, and I realized that without having to play with language or emulate another writer that the words that I already knew gave me the capability to encapsulate this moment in time. And my military training certainly didn't prepare me for that, and one the one hand I did feel that I had failed in some way, as you just discussed. And on the other hand, I really thought about this young man who was troubled, and after listening to the conversation today just realized how much I wish he had an outlet like poetry to get his feelings out there and his experience. So I'll take any comments off the air, but I just wanted to share that. Thank you very much. CONAN: Are you still writing, Zach? ZACH: Oh, definitely still writing. I won a People's Choice Award here in South Carolina back in 2010 for the single poem contest. It actually had to do with Native Americans and them running into early settlers. It was called "Confluence. But I'm still keeping it up, and I absolutely love it. And W.H. Auden is my favorite, by the way. CONAN: Thanks very much, appreciate it. CONAN: It's interesting, emulating other writers and adopting their phrases, their turns of language and then realizing that all the words you needed were already there, that's interesting. HARJO: You know, I think that's what we all do. We come in, and we emulate. And, you know, we listen, whether we're emulating birds, or John Coltrane or W.H. Auden. And that's how we learn. You know, that's part of us. I have my students - I talk about poetry ancestors and say we have poetry ancestors or music - jazz ancestors. You know, if you go - you know, it seems like everything - you know, we have those who came before and those who inspire us, and it makes a huge web of connection. CONAN: Here's an email we have from Dennis(ph) in Tulsa, your hometown: I love your poem "Eagle Poem." It's a very beautiful and spiritual poem. Did you experience Native American rituals in your youth or young adulthood that influenced your spiritual sensibilities? Is ritual still an active part of Native American life? HARJO: I was, yeah, just at the ceremonial grounds just the other night and really feeling happy and that people have really kept this up, because it takes a lot of effort. And so it is these rituals or it's more than a ritual. It's a way of being. I mean, we're all in rituals. We're in a ritual with the sun every day: The sun comes up and goes down. But yeah, it's - I think of language of being like ceremony or ritual, and so I think it's - ritual is important to all of us. CONAN: "Eagle Poem" is included in this memoir. I was wondering if you could read it for us. HARJO: Yes, I can. Do you remember what page? CONAN: I happen to have opened it to Page 154. HARJO: Pretty good. OK, here it is. (Reading) Eagle Poem. To pray you open your whole self to sky, to earth, to sun, to moon, to one whole voice that is you. And know there is more that you can't see, can't hear; can't know except in moments steadily growing, and in languages that aren't always sound but other circles of motion. (Reading) Like eagle that Sunday morning over Salt River. Circled in blue sky, in wind, swept our hearts clean with sacred wings. We see you, see ourselves and know that we must take the utmost care and kindness in all things. (Reading) Breathe in, knowing we are made of all this, and breathe, knowing we are truly blessed because we were born, and die soon within a true circle of motion, like eagle rounding out the morning inside us. We pray that it will be done in beauty, in beauty. CONAN: Joy Harjo, "Eagle Poem." It's published in "Crazy Brave," her new memoir. Let's see if we can get another caller in. This is - Karris(ph) is on the line, Karris with us from Pawleys Island in South Carolina. CONAN: Hi. You're on the air. Go ahead, please. KARRIS: Yeah. I can't believe two South Carolina people in a row, two South Carolina poets. Please ask Joy, is she familiar with the pianist Les McCann? KARRIS: Oh, yeah. I heard Les McCann in 1963, January, in a room by myself in Los Angeles, on television, and I cried because I from the South, and I didn't - I'd never heard anything like that at all. It changed my life completely. But what turned me to poetry was about a decade - or two decades ago, I had the opportunity to fulfill a somewhat latent dream of becoming a hermit monk, like Thomas Merton. And after a decade, I found out that I wasn't really cut out for that. Even though I wasn't a member of an order or anything, I had retired early and was living alone in my little retreat and kept my hours and hadn't thought of writing anything. Of course I was journaling, like most monks do. And one day, I knew I wasn't going to do this anymore, and I wrote a full book called "A Monk Descending." And one of - the last line in that poem, the title poem is: I shall leave this place of Cistercian silence, and I shall speak. CONAN: And have you kept speaking? KARRIS: And I'll - I tell you, with the resources on the Internet, it is just - you can receive an education on poetry. There are so many lectures and readings. And, of course, I've seen Ms. Harjo numerous times, and she is one that I go to frequently. CONAN: Well, we're glad you found a voice. Appreciate it. KARRIS: Thank you very much. CONAN: We're talking with Joy Harjo. Her new book is "Crazy Brave." You're listening to TALK OF THE NATION, from NPR News. And here's an email from Lovelace(ph), another one from Tulsa: I found my poetic voice a few years ago, but my mind went to a dark place and I have lost my voice. Do you have any advice on how to get my voice back, how to start again? HARJO: Well, that's interesting, because I felt like I had lost my voice, too. And sometimes, to find it, sometimes it needs to be - what I've learned is it needs to be lost for a while. And when it wants to be found, you'll find it. But I would say is that you just put yourself in the place of poetry. You just go where poetry is, whether it's in your heart or your mind or in books or in places where there's live poetry or recordings. And, you know, it's like looking for love. You can't look for love, or it will run away from you. But, you know, don't look for it. Don't look for it. Just go where it is and appreciate it, and, you know, it will find you. CONAN: Was that rediscovery more difficult because you were expected, at this point, a published poet, I expect? People were waiting for your next stuff. HARJO: Probably. Probably. It's interesting how it happens and - because I've always said I realize that every book of poetry came about, I was in love with somebody. And it was that falling in love and all of that, even though the book necessarily wasn't about that. And I decided - I finally - I've been doing a lot of music and even writing lyrics, but it just - it showed up. And I realized that - I hadn't realized how long it had really been gone, and it's come back with a fervor. I've written about 10 poems in the last couple of weeks, and I guess I decided just to be in love, anyway. CONAN: That may work out. HARJO: Yeah, it could. Who knows? CONAN: Let's see if we can get one more caller in. This is Casey(ph), Casey with us from Tulsa. CONAN: A lot of people calling and writing from Tulsa today. CASEY: Well, of course. I was just calling to say, you know, when I first discovered poetry, I was about 11, and my aunt had died. And she was 13. My grandparents raised me, so we were pretty close - me and all my aunts and uncles and everything. And then my uncle had gotten sick, and he had AIDS, and he died. And to go through all those emotions at that age - you know, everybody kind of looks at you like you don't really understand, or you just act happy, so they assume you're OK. And really, I wasn't OK. I remember waking up one day and thinking, I'm in a nightmare, and I just can't wake up out of it. This can't be my real life. So when I discovered poetry, I really realized that it was my way to talk to the world and tell them how I was feeling, but also my way to talk to myself and explain to myself, at such a young age, how I was feeling when I was so afraid to really tell everybody else what was going on with me. So it was such a beautiful thing. CONAN: And, Joy Harjo, it's interesting. We're right back to nightmare and fear. HARJO: Yes, I guess so. But, you know - yeah. But there's a lot of power in creativity. There's a lot of power in writing things down. Poetry - and poetry especially is like singing on paper, and it's something that - I think it feeds the soul. It's part of - you know, we all need soul food just as much as we need, you know, food food, and we all need that. Everyone needs that. CONAN: You also write: I believe that if you do not answer the noise and urgency of your gifts, they will turn on you, or drag you down with the immense sadness of being abandoned. CASEY: I believe that, too. I feel like, during that time in between my uncle's death and when I started writing, that it was just so - I felt like I was almost killing myself from the inside, like my mind was killing me. HARJO: And that can happen. I think on the other side of creativity is destruction, and, in a way, they, you know, they need to balance out. And when it's one or the other, you know, of anything, it can - you know, I think a lot of people are in mental institutions and in other places, prisons and so on, because they've - they need to create. CONAN: Casey, thanks very much for the call. Thanks to everybody from Tulsa who called and wrote in. We really appreciate it. CONAN: And especially our thanks to Joy Harjo, who joined us from Tulsa. Her new book is called "Crazy Brave." She performs nationally and internationally with her band The Arrow Dynamics, joined us from Public Radio Tulsa. Thanks so much. HARJO: Thank you so much. CONAN: This is NPR News. Transcript provided by NPR, Copyright NPR.